If you control a Level 7 or higher Normal Monster, when a monster would be Summoned OR a Spell/Trap Card is activated: Negate the Summon or activation, and if you do, destroy that card. All Speed Due.. While this card is on the field: The turn player can Fusion Summon 1 Fusion Monster from their Extra Deck, by banishing Fusion Materials listed on it from their hand or field. All Speed Duel Cards co..
All "Amazoness" monsters gain 200 ATK. Once per turn, when an "Amazoness" monster is destroyed by battle or card effect and sent to the GY: You can Special Summon 1 "Amazoness" monster from your Deck .. This legendary dragon is a powerful engine of destruction. Virtually invincible, very few have faced this awesome creature and lived to tell the tale. All Speed Duel Cards contain a new marker confir..
A monster with tremendous power, it destroys enemies with a swing of its axe. All Speed Duel Cards contain a new marker confirming their legality for Speed Dueling. Only cards with this special symbol..
A gargoyle enhanced by the powers of darkness. Very sharp talons make it a worthy opponent. All Speed Duel Cards contain a new marker confirming their legality for Speed Dueling. Only cards with this .. This dragon feeds on emerald. Enchanted by this monster even when attacked, few people live to tell of its beauty. All Speed Duel Cards contain a new marker confirming their legality for Speed Dueling.. Neither player can target Dragon monsters on the field with card effects. All Speed Duel Cards contain a new marker confirming their legality for Speed Dueling. Only cards with this special symbol ma..
During the End Phase, if this card is in the GY because it was destroyed on the field and sent there this turn: You can Special Summon this card, but its ATK/DEF become 1000. You can only use this eff..
During your Battle Phase, if your opponent controls a monster after this card's first attack, this card can make a second attack. Negate any Trap effects that target this card on the field, and if you..
During your Battle Step, if this card battles (Quick Effect): You can discard 1 Dragon monster to the GY; this card gains 1000 ATK/DEF until the end of the Battle Phase. 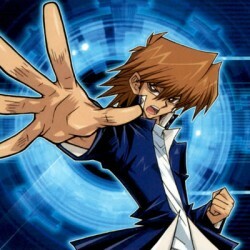 All Speed Duel Cards contain ..
You can Tribute this card; Special Summon 1 "Blue-Eyes White Dragon" from your hand. All Speed Duel Cards contain a new marker confirming their legality for Speed Dueling. Only cards with this specia..
Special Summon up to 2 Dragon monsters from your hand. "Lord of D." must be on the field to activate and to resolve this effect. All Speed Duel Cards contain a new marker confirming their legality fo.. If you control a Dragon monster: Target 1 Spell/Trap on the field; destroy that target, and if you do, inflict 500 damage to its controller. All Speed Duel Cards contain a new marker confirming their.. Discard 1 card; for the rest of this turn, reduce the Levels of all monsters in your hand by 2 (even after they are Summoned). All Speed Duel Cards contain a new marker confirming their legality for .. If you control "Blue-Eyes White Dragon": Destroy all monsters your opponent controls. "Blue-Eyes White Dragon" you control cannot attack the turn you activate this card. All Speed Duel Cards contain ..
All Dragon, Winged Beast, and Thunder monsters on the field gain 200 ATK/DEF. All Speed Duel Cards contain a new marker confirming their legality for Speed Dueling. Only cards with this special symbo..
Target 1 face-up monster you control; banish that target until the End Phase. All Speed Duel Cards contain a new marker confirming their legality for Speed Dueling. Only cards with this special symbo..
Target 1 Dragon monster you control; banish that target, and if you do, Special Summon 1 Dragon monster from your hand or GY. All Speed Duel Cards contain a new marker confirming their legality for S.. When your opponent activates a Trap Card during the Battle Phase: Negate the activation, and if you do, destroy it. All Speed Duel Cards contain a new marker confirming their legality for Speed Dueli..
A ferocious dragon with a deadly attack. All Speed Duel Cards contain a new marker confirming their legality for Speed Dueling. Only cards with this special symbol may be used for Speed Dueling, howev.. This dragon appeared from the sky and crashed to the earth. All Speed Duel Cards contain a new marker confirming their legality for Speed Dueling. Only cards with this special symbol may be used for S.. This Spellcaster attacks enemies with fire-related spells such as "Sea of Flames" and "Wall of Fire". All Speed Duel Cards contain a new marker confirming their legality for Speed Dueling. Only cards .. Legendary swordmaster Masaki is a veteran of over 100 battles. All Speed Duel Cards contain a new marker confirming their legality for Speed Dueling. Only cards with this special symbol may be used fo..
ey, dis mighty lissard man can swing his sword so fast, dat it's more dan da speed a sound! All Speed Duel Cards contain a new marker confirming their legality for Speed Dueling. Only cards with this ..
Much more than just a child, this dragon is gifted with untapped power. All Speed Duel Cards contain a new marker confirming their legality for Speed Dueling. Only cards with this special symbol may b..
Once per turn, during your End Phase: You can change the battle position of this card. All Speed Duel Cards contain a new marker confirming their legality for Speed Dueling. Only cards with this spec..